Market open Thursday afternoon, rain or shine. Don’t be a weather wimp. Our dedicated vendors sell their wares from 3:00 till 6:30, rain or shine, heat or cold. 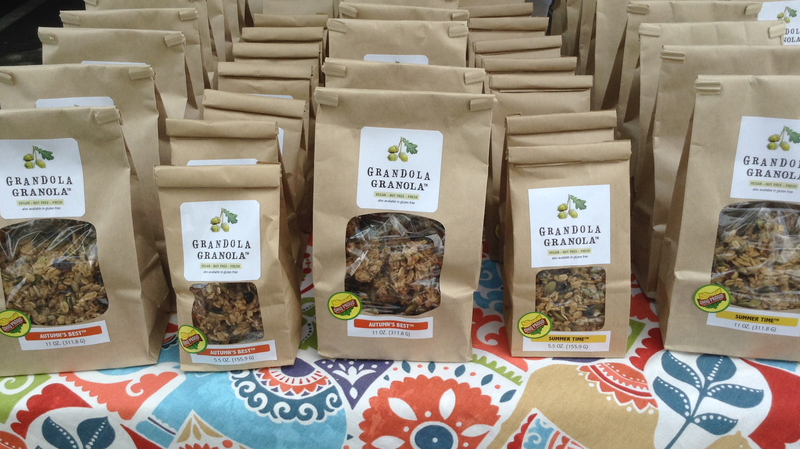 Make it worth their while and stop in for farm fresh produce and locally produced goodies like Grandola Granola. Made by a College Hill entrepreneur, it’s organic, vegan and delicious. They carry gluten free varieties, too. The recent rains have nourished our local crops, so expect to see abundant lettuce, greens, radishes, beets and more from Our Harvest. Our friends from Back Acres Farm will have tomatoes and zucchini from their hoop house, as well as meat, eggs, cheese and homemade yogurt. Don’t forget, you can also pick up bread, jams, garden plants and natural body care product from our other fine vendors. Aunt Flora sold out of peach cobbler last week, but will return this week with sweet potato and blackberry cobbler. You can place an order with her for the coming week if you have a special need for something. Miss Amanda, the Children’s Librarian at the College Hill Branch, is our guest for Kid’s Corner this week. She promises to bring a fun and lively mix of stories, songs and puppets from 3:30 – 4:30. Invite your friends and neighbors with young children for an hour of education and entertainment! From 5:00 to 6:30, singer/songwriter Charlie Millikin will perform a wide range of music from old to new. Enjoy pop, R&B, and some rock tunes while munching on an empanada from the Empanada Aqui food truck. See you at the market, rain or shine! This entry was posted in News and tagged Aunt Flora, Back Acres Farm, Bergefurd Farms, College Hill, College Hill Farm Market, College Hill Presbyterian Church, Empanadas Aqui, farmers' market, Grandola Granola, Llanfair Retirement Community, local farm, local food, North Oaks Farm, Our Harvest, Twin Towers, Village Green by College Hill Farm Market. Bookmark the permalink.